Thatcher’s boot boys ascend to an even “Higher” calling. The service of God. The leadership of the Church of England showed themselves to have the morals of sewer rats today after hundreds of police were drafted in to prevent a peaceful protest by disabled campaigners. A protest was taking place in the grounds of Westminster Abbey, where Disabled People Against Cuts, backed by Occupy and UK Uncut, intended to establish a camp for independent living to highlight the shameful decision by the current Government to close the Independent Living Fund (ILF). 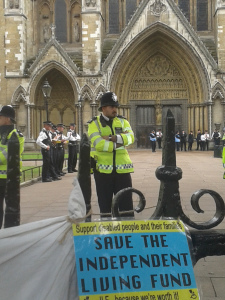 Whilst many people were able to enter the grounds of the Abbey, with several disabled activists taking control of the gates, they were soon joined by hundreds of police.